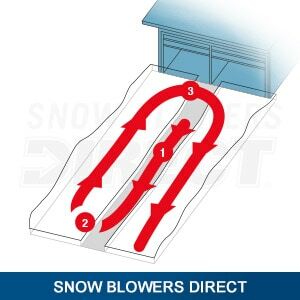 Your snow blower will move snow with ease, but if you're not maneuvering it in the right fashion, you may find yourself clearing the same area twice. Surely you agree that it's better to work smart than it is to work hard, and there's nothing more frustrating than having to make a second pass. By following 3 simple tips, you can be sure to clear snow more efficiently. As you're rolling your snowblower out of your garage, you should immediately head for the middle of the driveway. By starting in the middle, you can work your way outward in a circular motion and blow the snow away from where you've already been. Turn the direction opposite of where your chute is pointing, always keeping the chute pointing outward. As you make your turn, disengage the augers to prevent spraying snow against your home or garage. As you continue, move in a tight circular motion while working your way out until you've cleared the entire driveway. Think of how a lollipop swirls from the middle outward until it reaches the stick. That's the way you want to go until all of the snow has been pushed and blown outward away from the driveway. The Path to a Cleaner Driveway.. Our Power Equipment Direct how-to library can help you learn about Top-Rated & Best-Selling Three-Stage Snowblowers, Farmers Almanac Winter Weather Predictions and Proposition 65 Product Labeling.